In the age of the internet there is something beautifully anachronistic about this petition ritual, but it has its advantages—forcing candidates and their supporters to get out and talk to voters. This year I’ll be circulatingpetitions for candidate for controller Brett Mandel who probably doesn’t need my help as he appears to have assembled a really strong team. Also, I will be circulating petitions for a progressive slate for traffic court—community activists Inja Coates and Marwan Kriedie. Yes, traffic court! It will probably be (and should be) eliminated but probably won’t happen overnight and we need thoughtful, honest people in these positions to help restore our city’s faith in our courts. There are several other excellent candidates I would be happy to circulate petitions for but I’ve found that 3 is the maximum number you can ask people to sign without annoying them—and even that is pushing it. The weather may be miserable, but I enjoy getting out and chatting with my neighbors and it’s a great way to find out what has been going on in the neighborhood. Sometimes it’s good news—e.g., a good friend’s delight in her new grandchild. Too often it’s news of a death. Since there are a lot of seniors in our neighborhood, there is always some sad news. But petitions are part of the rhythm of life for political activists and for me February means petitions and early species crocuses! For someone like me who toils away in grassroots politics, the past few months have been very gratifying. The Philadelphia Chapters of the National Organization for Women and the Coalition of Labor Union Women, supported by a grant from the Bread and Roses Community Fund, on January 14 held a non-partisan workshop on Running for Election Board/Committeeperson. 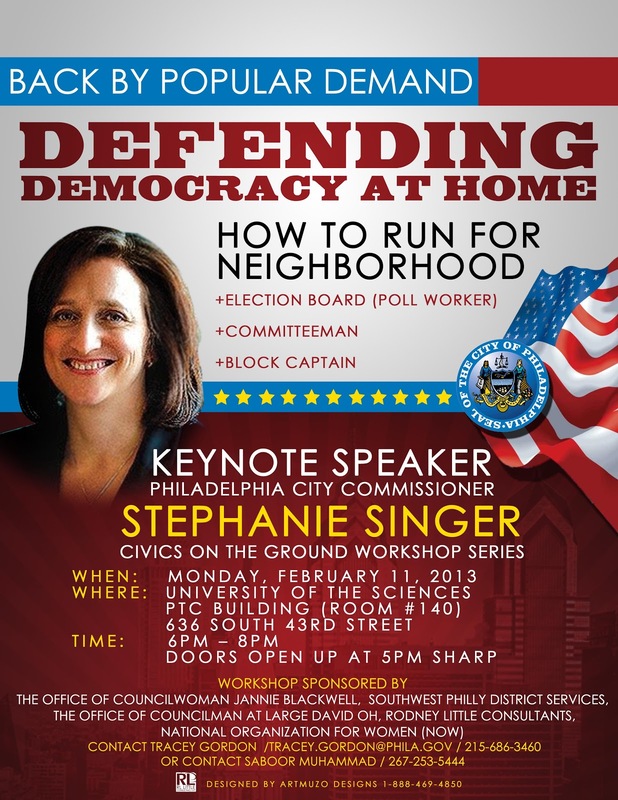 We focused on running for Electing Board offices which are on the 2013 primary ballot. The workshop much to our surprise drew a crowd of about 100 interested citizens. The audience was much larger than CLUW and NOW could have organized on our own and was mostly due to the stellar organizing skills of deputy City commissioner Tracey Gordon. More surprising than the number of attendees was the intensity of their interest. They were seriously engaged by principal speaker Commissioner Stephanie Singer’s lively, informative, and inspirational presentation. Nobody dozed off, despite the amount of technical detail. People seemed really hungry to learn how the election system works. Commissioner Singer‘s office then organized three additional workshops in various locations round the city—all very well-attended. Why the sudden interest in what had been very low profile positions—Judge of Elections and Inspector of Elections? From comments made at the workshops as well as from conversations I had with some of the attendees, it’s clear that Republican attempts at vote suppression have backfired and there is growing grassroots interest in safeguarding the right to vote. Thanks to Pennsylvania’s Voter ID law more and more citizens realize the critical importance of a well-run Election Board. The Brennan Center posts a detailed blueprint to make this happen. Low voter turn-out in mid-term elections has had serious consequences . If the people who came out in November 2012 had come out in 2010, we’d have a different congress and a different state legislature, with major consequences for redistricting. I think the only way to get more people to vote in mid-term elections is to make it easier to vote. People may be willing to wait in line for hours to vote for the President, but this generally doesn’t carry over to state legislators. And as president Obama has said, no citizen should have to stand in line for hours to vote!!! 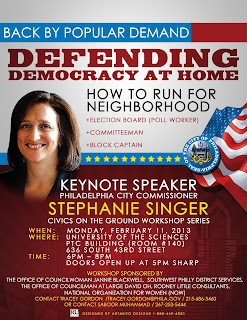 My passion at this stage in my life is civic participation. For me and for many other progressive activists, Republican attempts to suppress the vote have been the galvanizing force. The President’s’ Commission has added to the momentum. This is the time to tackle voting rights issues!! I manage to deal with GWS (Gardening Withdrawal Syndrome) in January and February by bringing in shrubs to force. 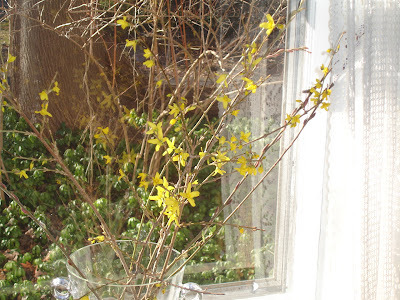 The easiest is Forsythia and this year the buds were beginning to swell in late December. A friend brought some forsythia to our New Year’s Party and by mid-January they were blooming inside. 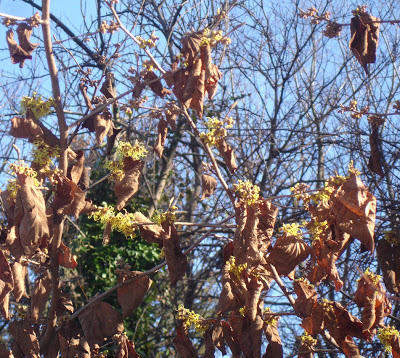 I had planned to force some witch hazel which usually blooms early February. I usually bring in a branch for forcing in late January but this year my witch hazel beat me to it and started blooming outdoors the third week of January. 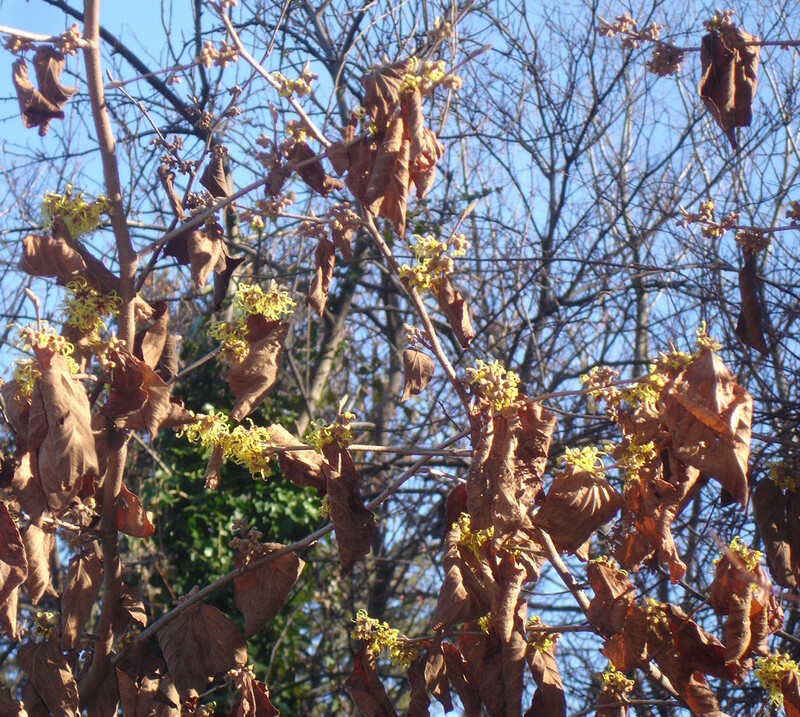 The sprigs of witch hazel which usual grace our breakfast room table in February were on the table in mid- January. What other surprises does our changing climate have in store for me this season?? ?